BANGOR, MAINE - Each year, Husson University’s New England School of Communications (NESCom) celebrates Halloween with a live radio broadcast of a classic Edgar Alan Poe story. This year is no exception as the University presents Edgar Alan Poe’s “A Predicament” on Friday, October 26, 2018 at 7:30 PM at the Gracie Black Box Theatre. In this terrifying tale, Signora Psyche Zenobia takes a walk with her poodle, Diana, and her servant, Pompey. Walking by a Gothic cathedral, the Signora’s inquisitive nature gets the best of her and the three enter the decaying structure. Once inside, the trio walks up the stairs until they reach the crumbling clock tower at the top of the cathedral. Does a horrifying fate await the curious Signora in the ancient clock tower? If so, how will her poodle react? And what about Pompey? The performance is free and open to the public. Members of the Gracie Theatre audience will have the opportunity to see everything that goes into the creation of a live radio drama – including the terrifying sound effects. This WHSN-FM adaptation draws on the original Poe story to create a new set of chills. 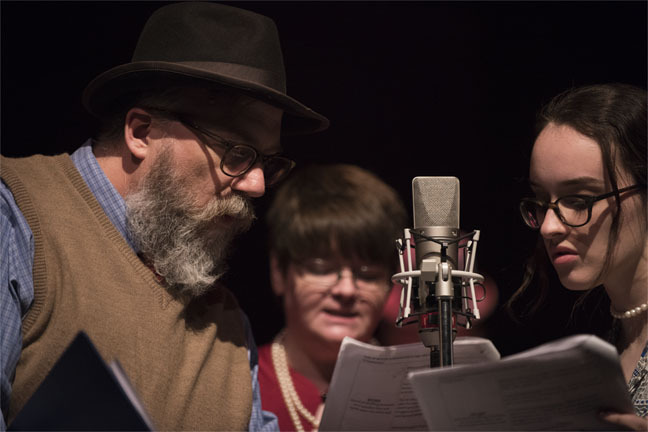 Billed as “Tales of Mystery and Imagination,” this award-winning broadcast features a cast of Husson University students and local area residents. The live radio drama will harken back to the broadcasts of yesteryear when radio was the leading form of popular entertainment. At that time, popular programs like “The Shadow,” “Lights Out” and “Inner Sanctum Mysteries,” ruled the airwaves. Ken Stack, an instructor in the entertainment production program at the New England School of Communications at Husson University, is the director of the radio play and is looking forward to the upcoming performance. “Unlike some people, I love the works of Edgar Allan Poe. To misquote the rock band Queen, ‘I’m just a Poe boy. Nobody loves me,’” said Stack. “You see, radio was “the theater of the mind.” Our annual live broadcast not only builds on that tradition, it serves as a valuable experiential learning opportunity for students in our broadcast communications program. In this way, we enrich the education of both our students and our audience,” concluded Stack. Since the radio drama is being simulcast on WHSN-FM, the show will start promptly at 7:30 p.m. Individuals interested in attending the live performance at the Gracie Theatre are requested to be in their seats no later than 7:25 p.m.
University also offers a degree in integrated technology for those who want to pursue careers in computer information systems, software development, and website design. NESCom specializes in communications and provides students with a hands-on experience that gives them the education and skills needed for today's job market. All poodle lovers can rest easy. No animals are harmed during the broadcast.